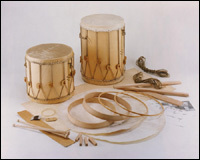 Drums have evolved slowly throughout the ages and one change that can clearly be seen is the different method of tensioning the skins between medieval and Renaissance drums. The medieval drum is rope tensioned directly onto thick goat skin heads and has a single snare on the beaten head, whilst the Renaissance drum applies the rope tensioning through counter hoops which spread the forces enabling the use of thinner calf skin heads. The easier vibration of the thinner heads allows a triple snare to be used on the non-beaten head. Our Drums are available in four versions: long or side, Medieval or Renaissance. Two drumsticks turned to an historic pattern are supplied with each drum. All of them have a laminated birch shell with traditional skin heads. A brass belt hook sets the correct playing position for the drum. Our Medieval Long Drum is 34cm diameter x 50cm long. The heads are goat skins tensioned by a system of hempen cord and sliding leather buffs. A single gut snare is fitted to the beaten head. Our Medieval Side Drum is 34cm diameter x 34cm long. The heads are goat skins tensioned by a system of hempen cord and sliding leather buffs. A single gut snare is fitted to the beaten head. The same range of Drums are offered in kit form for home assembly. No previous experience of instrument making is required to build our drum kits. A top quality 3mm laminated birch shell is supplied ready to assemble around pre-bent beech hoops using a set of 40 special clamps. Hemp cord, leather buffs, gut snares, a pair of traditional style drumsticks are all included in these versatile kits. 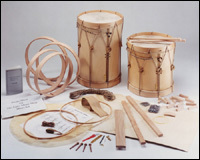 Medieval Drum Kits: The diameter of the drum is fixed but the builder determines the final depth of the drum up to 50cm and hence whether it is a side drum or a long drum. Renaissance Drum Kits: Two solid beech counterhoops are supplied bent ready for final fitting. The diameter of the drum is fixed but the builder determines the final depth of the drum and hence whether it is a side drum or a long drum. 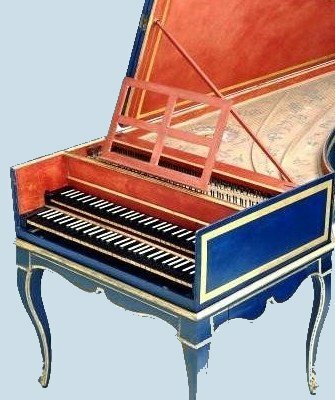 You can make the same Tabor from scratch, following detailed step-by-step instructions through the construction process in a clear and concise manner.